Discover four classic holiday drinks served throughout Europe! The holidays are filled with cultural and familial traditions alike, including endless rounds of cozy, heart-warming beverages. 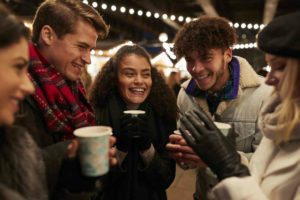 Americans may associate the holiday season with hot chocolate and eggnog, but how does the rest of the world prefer to cheers? Gather around the fire, and discover four classic holiday drinks served throughout Europe! A day of shopping at one of Germany’s Christmas markets is not complete without a hot mug of glühwein (mulled wine). With just one sip of glühwein, or ‘glow wine’, cold, tired tourists can quickly regain a sense of holiday cheer. Lemons, oranges, spices, red wine, and brandy make this classic German beverage a worldwide favorite! Every winter, the streets of Istanbul come alive with the intoxicating perfume of Turkey’s most famous holiday beverage. A unique flour made from the tubers of wild orchids in Turkey, salep is mixed with warm milk, sugar, and cinnamon to create a sweet, thick consistency, and is finally topped off with more cinnamon or a dusting of ground pistachios to create one of the country’s favorite treats. For locals and tourists alike, a sip of salep is the perfect way to warm up after a day of adventure! During the 13th century, wassail was served throughout the Christmastide English celebration to ensure a good apple harvest the following year. Originally, the English beverage was made of mulled ale, curdled cream, roasted apples, eggs, and other spices. Today, English citizens enjoy sweeter versions of the classic recipe with orange slices and a dash of honey. In Holland, the best way to unwind after a day of ice skating is to enjoy a hot cup of Anijsmelk. The traditional Dutch night-cap is made of frothed milk, anise seed, sugar, and honey. The locals use anise-flavored sugar cubes to create the perfect glass of Anijsmelk. The sweet and soothing, licorice-hinted beverage is best enjoyed slowly, and around a fire with close friends. This entry was posted on Wednesday, December 5th, 2018	at 9:33 am	. You can follow any responses to this entry through the RSS 2.0	feed. You can leave a response, or trackback from your own site.